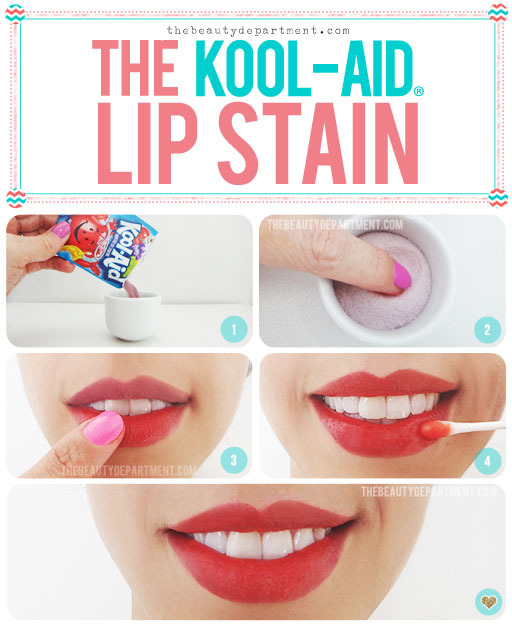 You are here: Home / Makeup / Get Punchy This Fall With Kool-Aid Stained Lips! Get Punchy This Fall With Kool-Aid Stained Lips! I poured it into a little bowl but you can merely use the packet as your container! STEP TWO: Dampen your finger (our lovely model Carissa licked hers but I don’t want to sound unprofessional, lol!). Press your finger in the powder to pick up one coat. STEP THREE: Rub your finger all over your lips. Try not to eat it immediately like we did; it is sooo hard because it’s so good! STEP FOUR: Dampen a Q-tip to go back over it and smooth out any clumps or uneven edges. Your honey will enjoy it too! Love This Look: Ombre Lips! What Do Men Think of Your Lipstick Color? National Lipstick Day!! What is your Go To Shade? Give Your Lips Some Love And Attention! Frederic Malle Lipstick Rose Parfum: A Review! « Babies and How Scents Affect Them!